As much as we would all love to say we are easily able to leave our problems and/or worries at the door when we enter the yoga studio, or simply “off the mat” no matter where are practicing yoga, we often arrive at our mat with the weight of worries upon us. After practicing yoga though, a great class may leave us feeling lighter and clearer. Ancient yogis, as well as many yoga teachers today, credit yoga poses and breath work for the removal of “blockage,” which then leaves you feeling refreshed, lighter and clearer. According to yoga, the subtle body is a part of all of us that cannot be seen or physically touched. The subtle boy is where our energy flows and is also referred to as the energy body. There are seven chakras in the subtle body that are said to be vortexes of energy. When energy becomes blocked in a chakra, the blockage can result in physical, mental, or emotional reactions, such as anxiety, poor digestion, and a feeling of exhaustion. A good yoga practice can remove the blockage, freeing up the energy and stimulating balance in the chakra(s). You can begin to look at your chakras as your own personal blueprint for self-care and use your yoga practice to realize the blueprint. Five of the chakras are connected to the elements of earth, water, fire, air and space. The last two chakras are connected to elements of light and cosmic energy. Once you begin to become familiar with the element that each chakra is connected to, you can begin to better understand how that element feels within your body and how to access energy through your yoga practice. 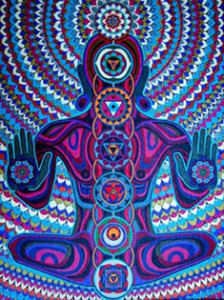 When our chakras are in balance, we feel strong and grounded. When they are out of balance, we may feel insecure and out of sorts – the opposite of grounded. Becoming in tune with our chakras, the parts of our self they are connected to, what they should feel like when they are balanced and unblocked, and what yoga poses can help to release blockage, can be a very important part of self-care and aid you in health and feeling free.